Adirondack River Stone comes from up North, and Skyview Stone stocks 5 sizes of this colorful round river stone. Approximate Sizes : 1/2" +/- , 1" +/- , 1.5" - 2.5", 2.5" - 3.5" , and Kobbles 5" - 10". Also this colorful stone comes in both round and crushed ( 1/2" and 3/4" - 1" ). 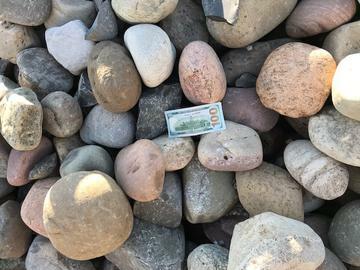 Could you imagine creating a lake with your very own waterfall running down into it, with these colorful stones at the bottom, and you are swimming in it with your very own fish....like your in a tropical reef. Put some nice evergreens around the area, and you have your own private tropical jungle oasis. 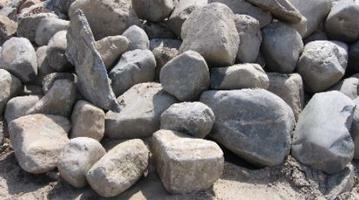 Skyview Stone sells River Stone and River Rock by the yard and Boulders by the ton. Adirondack River Stone can be used around your swimmimng pool, plants, or in the river from your waterfalls. If you need less than 1 yard of material, we will sell product by the pound. You can make your own River, in your backyard. 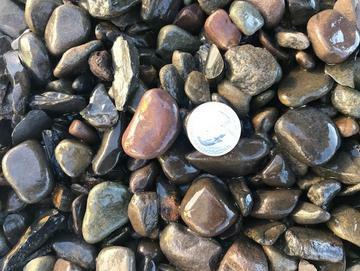 Using the larger Adirondack River Rock, 5" - 10" size, you can make the border edges of your river, and use the smaller river jacks and river stones as the river bed. Come down to Skyview Stone and pick out the Manhattan Granite Rocks (charcoal grey with sparkles), which you would like to see in your Waterfalls. You can make the water flow down your waterfalls and into your river which would go down stream to your pond. Place a recirculating pump with an undergound hose from the pond to the top of your waterfalls. Maybe even put some fish in the pond ! Larger River Stone can be used in Waterfalls and River Beds, or placed in concrete making a walkway with face of the stone exposed. These River Stone and River Rocks look great in Garden areas as well. Black Forest River Stone can be delivered or picked up with a truck or traier. 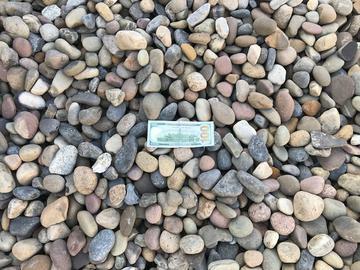 Black Forest River Stone, picture is after wet from rain. Basically is charcoal grey when dry, and almost black when wet. This product is 1/2" in size. This stone is angular in shape with smooth edges, allowing it to pack better than round stone, and is nice to walk on with bare feet. Long Island Smooth Round Boulders can be used in Waterfalls and to make Retaining Walls, or used as borders.